Hey, Frank Rich, Why not Listen to Egyptians? Three days after riot police first used tear gas and water hoses to chase away crowds in Tahrir Square, CNN’s new prime-time headliner, Piers Morgan, declared that “the use of social media” was “the most fascinating aspect of this whole revolution.” On MSNBC that same night, Lawrence O’Donnell interviewed a teacher who had spent a year at the American school in Cairo. “They are all on Facebook,” she said of her former fifth-grade students. The fact that a sampling of fifth graders in the American school might be unrepresentative of, and wholly irrelevant to, the events unfolding in the streets of Cairo never entered the equation. Anyone actually interested in the empirical study of digital activism/digital repression could tell Mr. Rich that both operate along a tactical continuum (image link) of digital advantage and disadvantage (full post). Yet I don’t think Mr. Rich is interested in making that argument, which admits the accurate observations on both sides and argues for more study rather than making declarations about winners and losers. It is an argument that does not lend itself to bombast. The talking-head invocations of Twitter and Facebook instead take the form of implicit, simplistic Western chauvinism. How fabulous that two great American digital innovations can rescue the downtrodden, unwashed masses. 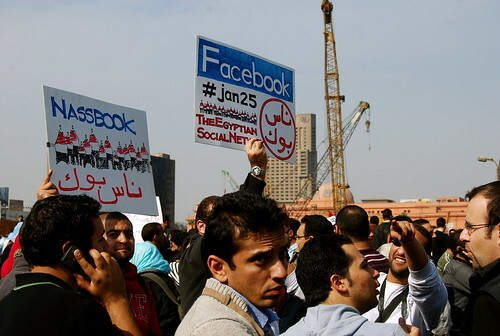 No one would deny that social media do play a role in organizing, publicizing and empowering participants in political movements in the Middle East and elsewhere. So why is he arguing in the first place? Maybe he just likes to argue.